Mannamead Care is a collection of care homes and independent living facilities based in Plymouth, UK. They are dedicated to creating vibrant communities for older people within safe and secure surroundings. Our team met with Mannamead Care to discuss their vision for a new website that would profile and reflect the standard of their care homes. They also wanted the ability to ‘search’ for a home that matched the user’s needs. Thinking about the audience, it was key that the website design was clear, the text easy to read, and the functionality simple. In addition, we created a photography brief and organised the shoot to provide a real sense of the personality behind each home and its activities. We kicked off with the copy keeping SEO in mind, while being sensitive to the user’s situation. To help those transitioning into care, we decided to interview selected residents and staff members to create a reassuring page of experiences. We delivered a website which fit the brief, both on an aesthetic level and a functional one. 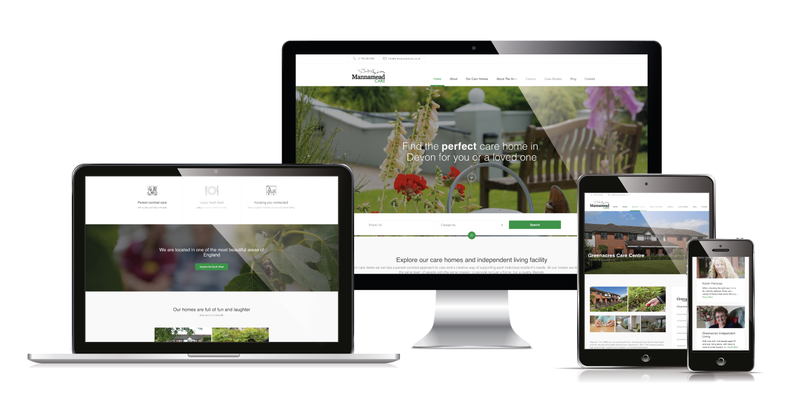 This modern website positively profiles each care home, and allows our client to reach potential residents inside and outside of the Plymouth area.